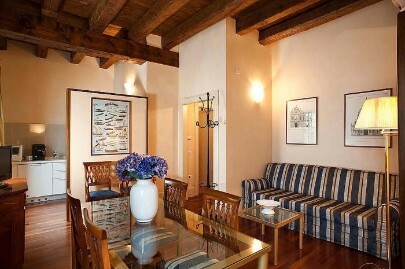 A range of exclusive apartments in a complex situated in the Dorsoduro district on the quiet island of La Giudecca. 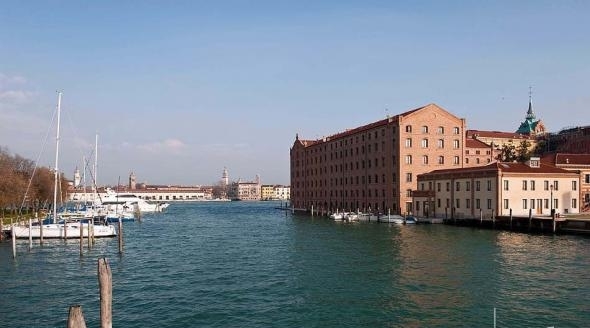 The dwelling occupies part of the former Molino Stucky, an ancient, prestigious building overlooking the lagoon. The apartments, lovingly and elegantly decorated in 17th-century Venetian style, include spacious living rooms, fully equipped kitchens, bedrooms with queen-size beds, and beautiful bathrooms made of exquisite Veronese marble. With their wooden ceilings and excellent furnishings, the interiors are the perfect place to relax and enjoy an unbeatable, romantic view of the lagoon and of its stunning colours, changing at sunrise and sunset. The dwelling offers guests every opportunity to immerse themselves in all the magic of this charming city, without forgoing the tranquillity, the comfort and services provided by this marvellous complex (such as breakfast service, daily tyding up and change of linen, private boat dock). This exclusive location enables guests to get in a 10-minute vaporetto ride to the Ponte dell’Accademia and the Piazza San Marco. Many a sight can be explored on foot: a walk along the Canale della Guidecca, for example, takes right past the island’s most famous church of Il Redentore. Square metres: 40, Situated on 4th F.: living/dining room, kitchen, 1 double bedroom, 1 bathroom with shower.